Portland, ME – The Worcester Railers HC (23-22-5-4, 55pts)continued their season long seven-game road trip with a 4-3 shootout loss to the host Maine Mariners (29-25-0-1,59pts) in front of 2,500 fans at the Cross Insurance Arena on Sunday afternoon. With the shootout loss, the Railers are now four points behind the Maine Mariners for the 4thand final playoff spot in the North Division. Game sevenof the Railers seven road trip is 7pm on Wednesday in Manchester, NH vs. the Monarchs. Matty Gaudreau, Ryan Hitchcock, and Bo Brauer scored for Worcester while Mitch Gillam made 28 saves in net as the Railers fell to 2-2-1-1 on their seven-game road trip. Dillon Fox scored twice to lead the Mariners offensively while goaltender Hannu Toivonen made 41 saves in net and stopped five of seven shooters in the shootout. Worcester led 2-0 and 3-2 in the hockey game and had several chances to win the game in overtime on the power play before falling in the seventh round of the shootout. A feisty first period saw 38 penalty minutes and a 1-0 Railers lead through 20 minutes of play. Matty Gaudreau (9th) fired home a rebound from just outside the crease after a Nick Sorkin shot was stopped by Hannu Toivonen at 5:33. Shots were 16-6 in favor of the Railers in the opening frame as Worcester also hit the post and a crossbar. Ryan Hitchcock (11th) gave Worcester a 2-0 lead at 6:24 of the second period after Tyler Barnes won the puck in the right corner and found Hitchcock alone in the right slot. Dillan Fox (5th and 6th) scored twice in a 1:57 span soon after as he struck on the power play at 8:17 and an even strength tally at 10:14 to tie the score at 2-2. Shots were 29-22 in favor of Worcester through 40 minutes with Maine holding the advantage on power play opportunities 5-1. Bo Brauer (5th) put the Railers back ahead 3-2 at 4:29 of the third period after a Ryan MacKinnon point shot was stopped by Toivonen and Brauer slammed home the loose rebound. But Maine would tie the score again 3-3 at 7:08 as Johnny McInnis (5th) snapped a shot top shelf on the rush from 25 feet. Shots were 11-7 in favor of Worcester in the third period. Worcester would have several chances in overtime on the power play as they outshot Maine 4-2 in the extra session but neither team would score. Ivan Kosorenkov and Tommy Kelley scored in the shootout for Worcester through seven rounds before Josh Couturier won the game in the 7thround. Notes: Three Stars: 3rd star: Hannu Toivonen (41 saves, Win) 2nd star: Dillon Fox (2-0-2) 1st star: Johnny McInnis (1-1-2, shootout goal) …. final shots were 44-32 in favor of Worcester…. Hannu Toivonen (4-3-0-0) made 41 saves on 44 shots for Maine…. Mitch Gillam (14-13-4) made 28 saves on 31 shots for Worcester and stopped four of seven shooters in the shootout….while Ryan Hubbard was the emergency backup…. Worcester went 0-for-3 on the power play while Maine went 1-for-5…. Kyle McKenzie (inj), Matt Schmalz (inj), Tommy Panico (inj), Alex Vanier (inj), Connor Doherty (inj), Yanick Turcotte, and Malcolm Gould did not dress for Worcester…. 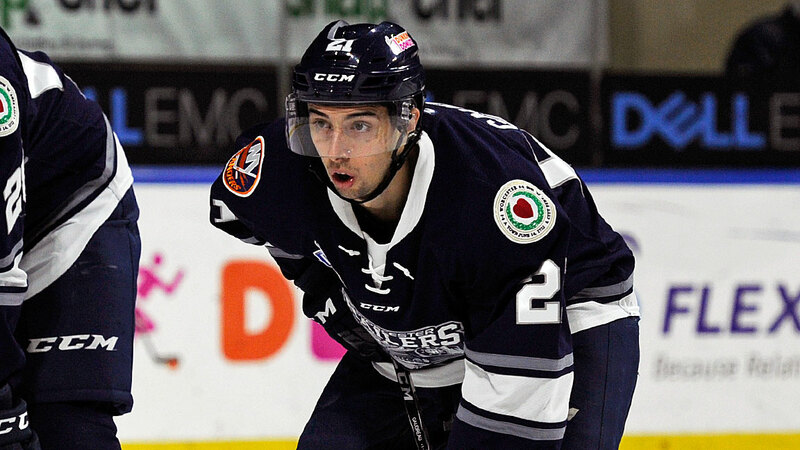 before the game Evan Buitenhuis was recalled to the Bridgeport Sound Tigers….Jeff Kubiak is on recall with the Bridgeport Sound Tigers…. Nick Sorkin, Josh Holmstrom, David Quenneville, Ryan MacKinnon, and Tyler Barnes added assists for Worcester…. the Railers are now 10-14-1-3 on the road this season and 2-2-1-1 on their season long seven game road trip…. Worcester has allowed 17 goals in their last three games….Ryan Hitchcock now has 21 points (10-11-21) in his last 17 games and fired a game high eight shots….Josh Holmstrom picked up his third fighting major with a first period scrap vs. Ryan Ferrill….Bo Brauer (2-1-3), Josh Holmstrom (0-2-2), Nick Sorkin (0-2-2), David Quenneville (1-1-2), and Matty Gaudreau (1-1-2) all have two game point streaks…Worcester falls to 2-4 in the shootout….five of the 11 meetings between the Mariners and the Railers have gone more than 60 minutes – Maine has won all five. The Railers season long seven game road trip concludes on Wednesday, Feb 27 with a 7pm (ET) faceoff in Manchester, NH vs. the Monarchs. Coverage begins at 6:35pm (ET) on 98.9 NASH Icon.